On your 1974 1975 1976 1977 1978 Trans Am and Firebird you could have up to 4 styles of t-tops on your car. This section is devoted to t-top model exclusive items. From headliners to small trim items and seals if your car had t tops and it is available new today you will find in this section! This is a pair of the t-top headliner retainer trim. This is a new pair (includes left and right side units. These are the U shaped trim pieces. This is a 4 pc set of the replacement t-top slide Grommets. These install on the actual t-top where t-top slides onto the chrome posts at the middle of the roof. This is a set of 4 t-top repair clips for 78-81 Trans Am, Firebird, and Camaro with factory installed Fisher brand t-tops. After time and wear the mounting tabs where the t-top attaches at the middle of the roof tend to bend and then worse break! These slide clips are strong metal and slide on the t-top at the opening and will once again allow the t-top to latch and slide in place tight once again. Stops wind noise and may also stop t-top leaks! install time in under 5 minutes at home! This is a roof mounted weather seal retainer used on the 1978 - 1981 Fisher t-top Camaro and Trans Am. 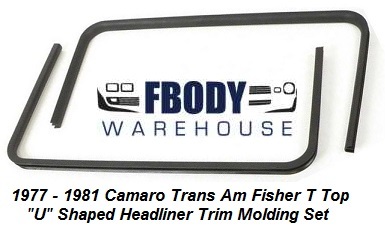 This is a set of NEW T Top "Y" Trim Pieces for 1978-1981 Camaro and Trans Am with Fisher T Tops. This is a complete interior t-top trim set for 1978 - 1981 Camaro and Firebird / Trans Am with Fisher T-tops. This is a complete kit includes all of the items listed below. We are the only company to offer a total full kit for 1978 1979 1980 1981 Camaro Firebird Trans Am with Fisher factory installed t-tops in one kit! 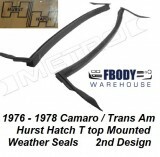 This is a set of 2 new reproduction T Top Y trim pieces for 1976 - 1981 Camaro and Trans Am with Hurst Hatch T Tops. Units replace damaged or missing factory units. Have the proper position for the screw tab so the striker connected as it should when clamped down. This is a set of new reproduction Fisher T Top front end caps for 1978-1981 Camaro and Trans Am. Units fit 1978 1979 1980 1981 Camaro Firebird Trans Am with Factory Installed Fisher Brand t tops. This is a set of new reproduction REAR side end caps for 1978-1981 Camaro and Trans Am with Fisher T Tops. These "L" braces mount to the body of the car on the curve where the T Top sits in and these are what the T Top slides into to secure it onto the center roof. This is a pair of NEW fisher T Top weather seals that go around the t top roof for 78-81 Camaro and Trans Am.Units are produced by Metro Moulded and offer the best fit and quality in the industry. These units come standard with a 15 year replacement warranty! These are the seals which mount onto the body. They start at the lower windshield, run up to the top of the A pillar and then cut in and go around the t-top opening on the body. They then come back to the B pillar and drop down to the top of the door edge at the back ledge of the door. This is a set of NEW reproduction upper seat belt covers for 1978 - 1981 Camaro and Trans Am. For use on Fisher brand factory t-top equipped cars. Produced by Metro Moulding this weather seal kit is the industry best as per fit and function in the industry.With a 15 Year replacement warranty rest assured your investment is protected! NOTE: This is merely the "base" kit use the various drop down menus below to add a wide variety of other weather seals which your car may need. Also note when you customize and build your kit below you save big $$ over buying these same items individually. See our video library for full instructional videos on all parts in this kit! For use on 1978 1979 1980 1981 Camaro Firebird Trans Am. These are the Fisher (factory installed) single handle release t-top secondary seals. These units are produced by Metro Molded and are an excellent fit, which include a 15 year replacement warranty. These seals mount onto the actual t-top itself and the window glass when rolled all the way up will seat into this seal. If your car leaks at the top of the A pillar or at the B pillar there is a good chance these seals need replaced. Here is a 2pc set of brand new 1st design Hurst Hatch style T-top body primary weather seals These go up the A Pillar around the opening and down the B pillar. This is the seals that go in the frames mounted onto the car itself. The seals are high quality pieces good for any application and they come with a 15 year replacement warranty. Don't settle for cheap ones that don't fit, Metro Molding makes the best weather seals in the industry in our opinion. These are the FIRST DESIGN SEALS The easiest way to tell the difference is by looking at the inside of the car around the t-top opening. 1st design seals will have a rubber lip that holds up the headliner where 2nd design seals will have a plastic trim molding to hold up the headliner. Here is a 2pc set of brand new 1st design Hurst Hatch style T-top mounted weather seals These mount on the actual t-top and provide the seal between the t-top and can side window glass. Weather seal kit for 1976 - 1979 Camaro and Trans Am with Hurst T Tops. On this design the primary t-top weather seal holds the headliner of the car in place around the t-top opening in the roof of the car. Produced by Metro Molding this weather seal kit is the industry best as per fit and function in the industry.With a 15 Year replacement warranty rest assured your investment is protected! * We offer a complete add on list so you can add all of the other various weather seals through out your car at a discounted price when you bundle and "customize your kit to your needs"
1978 - 1981 Camaro Trans Am T-top Mounted Trim Panels WITH INSTALL VIDEO! This is a set of 78 - 81 T-top trim panels which mount on the actual t-tops and the handle protrudes through them. For use on factory installed Fisher Brand t-tops. Units fit 1978 1979 1980 1981 Camaro Firebird / Trans Am models. 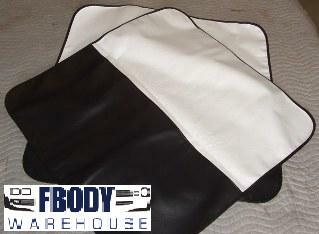 This is a pair of new replacement factory equipped Fisher style t-top storage bags. New reproduction units protect your t-tops while not installed on the car. New replacement Fisher t-top handles are here! No more pitted or bent units replace your worn handles with NEW reproductions! Units are 100% correct and look simply amazing. Also includes new mounting hardware for a proper and fast install! This is a weatherseal kit for 76078 Trans Am with the 2nd design hurst hatches. New Muscle Car Industries Resto-Fit Series tooling ensure a no leak original fit every time. Correct outer side rail seals for 1978 1979 1980 1981 Camaro and Trans Am models. These mount to the T-top glass panel. If the door glass was rolled all the way up, it would seal to these rubbers. Muscle Car Industries weatherstrips are made to O.E. specs for a perfect seal every time. For use with Muscle Car Industries Primary t-top seals. Fit is excellent on your factory FISHER t-top F body. Units install easily and stop both water leaks and wind noise! After 30 years factory seals wear and allow both wind noise and water to enter the cabin. Installing new weather seals is a great and easy way to preserve your car, and also increase it’s value! 1978 - 1981 Fisher Brand (Factory Issue Primary T-top Weather Seals Produced by Muscle Car Industries. Units offer a 15 year replacement warranty and fit very well. A little cheaper then Metro Moulded price wise are great for the builder with a budget! New replacement t-top retainer clips. Sold individually or as a set.New to the market place. Fro use on 1978 1979 1980 1981 Camaro Firebird Trans Am with factory t-top clips. Here is a 2pc set of brand new 2nd design Hurst Hatch style T-top mounted weather seals These mount on the actual t-top and provide the seal between the t-top and can side window glass. Here is a 2pc set of brand new second design Hurst Hatch style T-top body primary weather seals These go up the A Pillar around the opening and down the B pillar. These are the SECOND DESIGN SEALS The easiest way to tell the difference is by looking at the inside of the car around the t-top opening. 1st design seals will have a rubber lip that holds up the headliner where 2nd design seals will have a plastic U shaped trim molding to hold up the headliner. On this design the primary t-top weather seal does not hold the headliner board in place. Instead the headliner board is held in place by a plastic U shaped trimmounted by about 14 screws on the interior of the car. 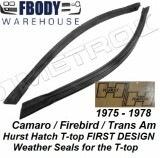 For use on both first and second design Hurst Hatch t-tops.Used on 1975 1976 1977 1978 Camaro Firebird Trans Am. Metro Moulded produced with a 15 year replacement warranty and produced in the USA! These are the rubber bump stops which mount on to the front and rear latch mechanisum and when you snap the t-top latch to the closed or "latched" position these are the rubber grommets which come in contact with the front Y shaped trim or the B piller rear strike plate plastic trim by the sail panel. Replacing these reduces wind noise and also can prevent water leaking as they wear out after 40 years! These are a must replace when doing new weather seals! 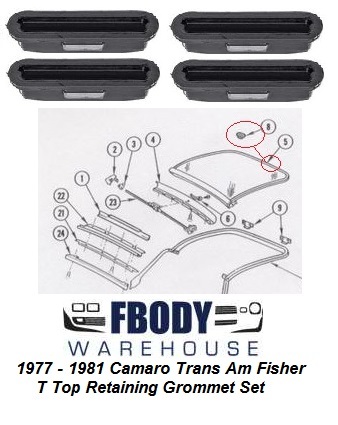 1978 - 1981 Fisher Brand (Factory Issue Primary & Secondary T-top Weather Seals Produced by Muscle Car Industries. Units offer a 15 year replacement warranty and fit very well. A little cheaper then Metro Moulded price wise are great for the builder with a budget! Ready to go on your driver quality car. As always FREE SHIPPING inside the USA.